Many people take for granted the great functionality they can add to their kitchens through the use of accessories. For example, a kitchen sinks can do a lot more than just washing your dishes with the correct set of accessories. A kitchen sink becomes a complete tool as soon as you install a faucet, perhaps the most important accessory that your kitchen will ever had. Usually taken for granted, kitchen sink faucets are meant to bring alive any type and model of sinks. Though some faucets work better in certain sinks, in general there are three popular kitchen faucet configurations that you should consider: single and double handle faucets, pull-out spray faucets and wall mount kitchen faucets, each providing a wealth of opportunities to transform your kitchen. The kitchen faucet that will perhaps extend the life of your sink is the pull-out faucet, which comes as a great tool because it extends several inches (and in some cases several feet) outside its fixed base. Unlike traditional faucets, the pullout kitchen faucets are perfect for large kitchen sinks (those with 2 or more basins) and for homeowners with high traffic kitchens. The spray feature in pull-out faucets is ideal for saving water at the moment of washing your dishes or cleaning thoroughly delicate food items. Many homeowners don’t realize the importance of keeping their kitchen drain pipes clean and free of debris that can cause buildup and eventually clogging. Each year homeowners spend millions of dollars in toxic cleaning agents or even hiring professional plumbers to clean their pipes; money they could have saved if they had installed a kitchen sink strainer. Kitchen sink strainers have been around for many years but in the last few years manufacturers have gone overdrive creating strainers made with different materials and even with interesting features. Though the traditional sink strainer is made of metal (stainless steel for the most part), there are kitchen sink strainers made of plastic and silicone. 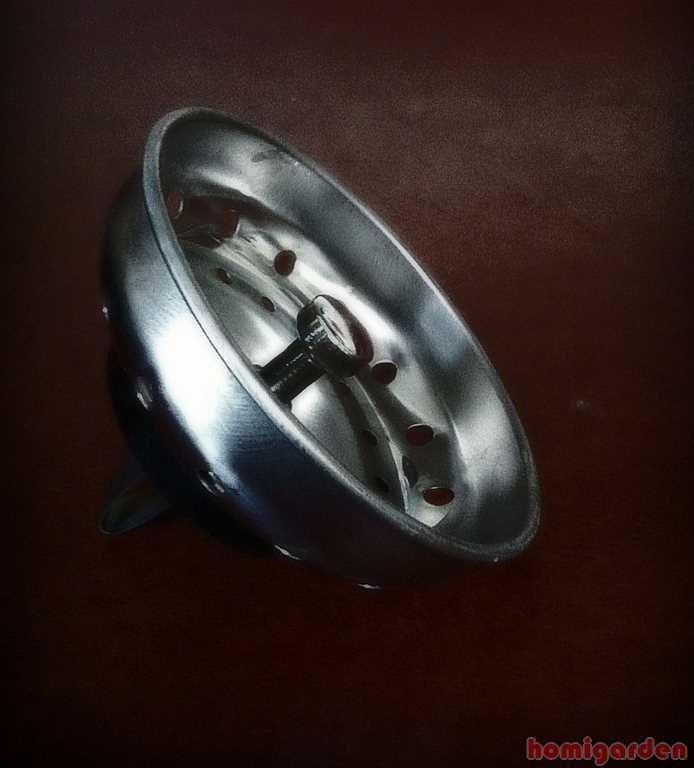 Regardless of your choice of material, the idea behind the strainer is basic: to catch bits of food items that would otherwise collect into your drain pipes causing all sorts of problems. Before your outfit your kitchen sink with a strainer, make sure that it is the right size and that it will lock in place. There are strainers that can also close your drain so that you can fill-up your sink with water. Most strainers are very affordable and easy to install. Kitchen sink bottom grids serve a very important function: to protect your kitchen sink from scratches. This is another kitchen sink accessory that is taken from granted and most homeowners go on living their lives not considering the benefits of a kitchen sink grid. According to many experts, any solution that adds years of use to your kitchen sink is worth the try. Kitchen sinks usually endure great hardships at the hands of homeowners, who throw in heavy pots and pans and sharp objects such as knives, causing scratches on the surface of their sinks that over time may become visible and even collect minerals that may expand and damage the finish. A simple grid, which fits tightly at the bottom of the sink, will protect the surface of the bottom of your sink while allowing enough drainage to let water and particles of food to pass by without much effort. Some kitchen sink grids are made of stainless steel and could have silicone feet that grip the surface of your sink locking in place. If the bottle of dish soap is another eye soar that you want to remove from your kitchen, then consider an elegant soap dispenser. Now more than ever, homeowners are finding many alternatives to add decor to their kitchens through the use of soap dispensers. But kitchen sink soap dispensers are meant to add much more than style but also functionality, as these may come with great features to enhance the use of your kitchen sink. For example, you will find electronic kitchen sink soap dispensers, which deliver the right amount of soap without having to touch the pump. Other soap dispensers are meant to block leaks, saving you money on the long run. And other models of soap dispensers can double as hand sanitizes or even lotions as well, so that you have a complete personal care system available at your fingertips. Don’t let your kitchen slow you down. Get a lot more done in less time with the right tools and accessories for your kitchen sink.